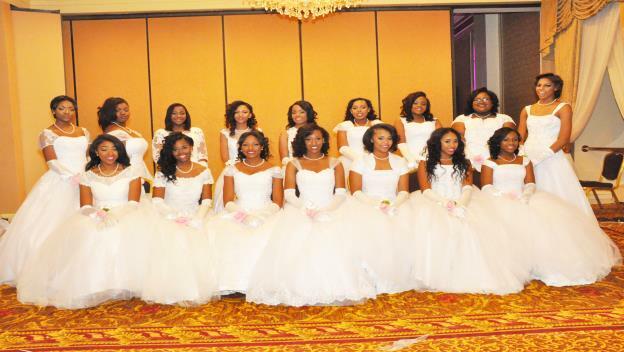 Taylor Alexandria Beamon, a student at Messmer Catholic High School, (front row center) was named the Debutante at the 42nd annual Debutante Cotillion organized by the Epsilon Kappa Omega Chapter of the Alpha Kappa Alpha Sorority. The event was held November 28, 2015 at the Pfister Hotel. Other participants were: First Runner-up Raven Alexandria Avery Moore from Brookfield Central High School; Second Runner-up Alexandria Lavonne Brown from Milwaukee Lutheran High School; Sydney Janay Calmes from Nicolet High School; Jaazmin DeDeios Hairston-Chainey from Eastbrook Academy; Ayanna Niambi Ellzey from Rufus King International High School; Karia Michele Guy from Dominican High School; Cairee Simone Carrington from Brookfield East High School; Velicity Alana Strong-Howard from Whitefish Bay High School; Jennifer Michelle Jackson from Riverside University High School; Jaylen Kiez Luter from Hope Christian High School; Savannah Danielle Rice from Rufus King International High School; Kamryn Elizabeth Sprewer from Franklin High School; Raven Arryan Stamps from Milwaukee Lutheran High School; Nicole Leslie Thompson from Ronald Reagan High School; and Zahria Lonnae Tucker from Brown Deer High School. Beamon plans to attend Texas Southern University to study sociology and pre-law. Moore plans to attend the University of Illinois Chicago and major in art education. Brown plans to attend Howard University and major in criminal justice.